Portable external USB powered Zip Drive. Reads and writes to 250MB and 100MB Zip disks. 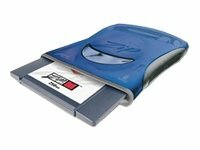 Includes 250MB Zip Drive, USB cable, Quick start guide nad Solutions CD with software.